Today, Kurt Cobain would have celebrated his 50th birthday. The Nirvana singer, guitarist and songwriter died from a self-inflicted gunshot wound in April of 1994 at the age of 27. During his lifetime, Cobain spearheaded an international phenomenon, becoming not only the most visible representative of Seattle's grunge scene but also an icon for a whole generation of disenfranchised youth. He was the antithesis of all the rock gods who came before him, a star who seemed to loathe his own fame while serving as a vocal proponent for feminism and gay rights as well as old-school punk authenticity. In honor of a legacy that has grown even stronger since his passing, here are 12 quotes from Cobain that encompass his wisdom and beliefs. The shoulder-length blond hair. The stubble. The youthful face with its permanently weary gaze. Kurt Cobain is still instantly recognisable as one of the most iconic faces of the 1990s, and the most important musician of the grunge scene. It is almost staggering to realise he would now be entering his sixth decade. On the day the Nirvana singer would have turned 50, what explains his enduring influence? His daughter Frances Bean Cobain, who was not even two years old when he died, tweeted a happy birthday message to her father in the early hours of Monday. "If any of you in any way hate homosexuals, people of a different colour or women please do this one favour for us - don't come to our shows and don't buy our records." Kurt was outspoken on gay rights, homophobia and sexism. He said he wished he'd been gay, just to annoy homophobes, and often wore dresses to protest against sexism. "Wearing a dress shows I can be as feminine as I want," he told the LA Times, in a jab at the macho undercurrents he detested in rock. "I'm a heterosexual... big deal. But if I was a homosexual, it wouldn't matter either." He admitted to spray-painting cars with "God is gay" and was once arrested for graffitiing by police in Aberdeen, Washington State. The band came to represent Generation X but he had no time for apathy. "I'm disgusted by my own and my generation's apathy. I'm disgusted at what we allow to go on, by how spineless, lethargic and guilty we are of not standing up against racism, sexism and all those other 'isms' that the counterculture has been whining about for years while they sit and enforce those same attitudes every night on their televisions and in the magazines." "What's alternative? What's counterculture? What's cool? Who knows? Who cares? If chasing cool is important to you, you're an idiot! ", Kurt said in a 1991 interview. 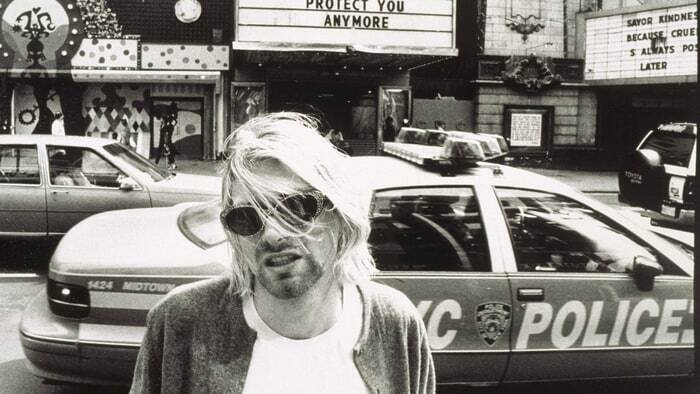 And, for someone who came to be seen as a spokesperson for his generation, Kurt rejected any hype about their so-called "overnight" success (actually five years in the making). "I'm not into ambition or salesmanship, we're not some new trend. We never meant or tried to be cool, or be a 'buzz' band. It never even entered our minds." It would be easier to list who Nirvana didn't influence than who they did. Lana Del Rey, Blink-182, Justin Timberlake and Jay Z have all quoted Nirvana songs in their own lyrics, while Weezer once played an entire concert of Nirvana covers. "Cobain changed the course of where the music went," said Vernon Reid of rock band Living Colour. "There are certain people where you can see the axis of musical history twisting on them: Hendrix was pivotal, Prince was pivotal, Cobain was pivotal." Nirvana launched a million garage bands - the simple barre chords that open Smells Like Teen Spirit are the first song many guitarists learn - and helped foster a do-it-yourself attitude that now permeates everything from indie to pop and grime. They introduced legions of fans to alternative music, pushing associated acts like Soundgarden, Pearl Jam and Kurt's favourites The Pixies into the mainstream. But speaking in 1991, Kurt downplayed his own musical talents. "I don't understand anything technical about music at all. I don't understand any of it, why you can't put these sounds together with those sounds. I only know what sounds good to us. "I, or we as a band, never really copied anybody or spent time learning other people's songs. We were never good enough or had the patience to do it! So we put that energy into putting our own stuff together. We're from the learn-­as­-you-­play school. We're still in it." Anyone lucky enough to have seen Nirvana play live would attest to the power of their live performances. But some became remembered for other reasons. When they played at Top of the Pops in 1991, the band were advised to sing live over a pre-recorded backing track. Nirvana decided they'd rather not, thanks all the same. Instead, Kurt sang Smells Like Teen Spirit in a much lower voice, changed some of the lyrics and barely touched his guitar. The rest of the band performed in a similar vein, emphasising the fact they were very much not playing it live. Similarly striking was their appearance at the 1992 Reading Festival. It was August bank holiday weekend and rumours had been circulating that Kurt and his wife Courtney Love, who'd just given birth to Frances Bean, were deeply unwell. In response, he came on stage in a wheelchair, wearing a hospital gown and a blond wig, sticking two fingers up at the music press. It was Nirvana's first time headlining the festival - but it would also be their last UK performance. Dave Grohl said they had barely rehearsed but, somehow, that didn't matter. Given the cult that has grown around Nirvana's music and Kurt's death, it's easy to forget the star was unusually eloquent and passionate. Dig out some archive interviews and his quotes sound surprisingly contemporary. Others, though, seem chilling with the benefit of hindsight. "I never wanted to sing. I just wanted to play rhythm guitar - hide in the back and just play." "I definitely feel closer to the feminine side of the human being than I do the male." "The duty of youth is to challenge corruption." "I wanted to have the adoration of John Lennon, but have the anonymity of Ringo Starr." "I really miss being able to blend in with people." "Rap music is the only vital form of music introduced since punk rock." Kurt tore himself to shreds worrying about fame and selling out. In Utero, the follow-up to Nevermind, was deliberately abrasive while Nirvana often refused to play Smells Like Teen Spirit in concert. But their MTV Unplugged concert - released as an album after Kurt's death - showed how the band could have survived in the longer term. It's unusual for a live record - in that it sidesteps the band's hits in favour of more obscure songs and a slate of covers very few people had ever heard of (including three tunes by The Meat Puppets). But it is beautifully, nakedly emotional. Kurt performed the set in one unbroken take, surrounded by lilies (the flowers of death) hunched over in his oversized cardigan. His fingers sometimes fumbled on the unfamiliar acoustic guitar, but that only heightened the frailty of his lyrics. If the band needed to find a way out of the corner they'd backed themselves into, this was it. Like Dylan going electric, but in reverse. "I'll never forget after we did Unplugged, how happy Kurt was - he was so happy," bassist Krist Novoselic told the BBC's Seven Ages of Rock programme. "He was really really happy after that. He was relieved, and we pulled it off." The star himself had previously hinted this was a path he wanted to explore. "It might be nice to start playing acoustic guitar and be thought of as a singer and a songwriter, rather than a grunge rocker because then I might be able to take advantage of that when I'm older," he told a French journalist in 1993. "I could sit down on a chair and play acoustic guitar like Johnny Cash or something, and it won't be a big joke." Kurt Cobain's daughter has thanked him for the gift of life on what would have been his 50th birthday. Frances Bean Cobain, who was 20 months old when her father killed himself, posted a handwritten note to him on her Instagram account. "Today would have been your 50th Birthday. You are Loved and you are missed," she wrote. "Thank you for giving me The GIFT of Life. Forever your Daughter, Frances Bean." The Nirvana frontman was 27 years old when he shot himself dead at home in Seattle in 1994. His band had gained worldwide fame just three years earlier with Smells Like Teen Spirit, from their second album Nevermind. Frances Bean Cobain was brought up mainly by her mother, Hole singer Courtney Love. Her godparents are REM's Michael Stipe and actress Drew Barrymore. 0 Response to "The Tao of Kurt Cobain: 12 Great Quotes From the Nirvana Frontman"